Welsh terrier dog breeds were originally raised as hunting dogs. But, this native breed of Wales quickly rose to become show dogs. Breeders attempted to surpass one another by developing the Welsh terrier dogs' wiry coats and natural coloring. Folks usually take a Welsh terrier dog because the dog is one of the most good-natured of terriers breeds. You may think that this temperament will make the dog one of the most boring Terries. The truth is that even the most die-hard terrier fans can have fun with this dog. This is because Welsh terrier dogs love to play. This makes them a great companion dogs. Although this dog does not have as much energy as other breeds, it’s still a terrier, which means it still has high levels of energy. For this reason, it is advisable to give them adequate exercise regularly. Another good tip to follow is to socialize the dog at a young age. This would help the dog to be friendlier to humans and other dogs and to develop a good tolerance towards other animals. In general, the dog is friendly with kids, as long as the kids don’t provoke him or bother him too much. 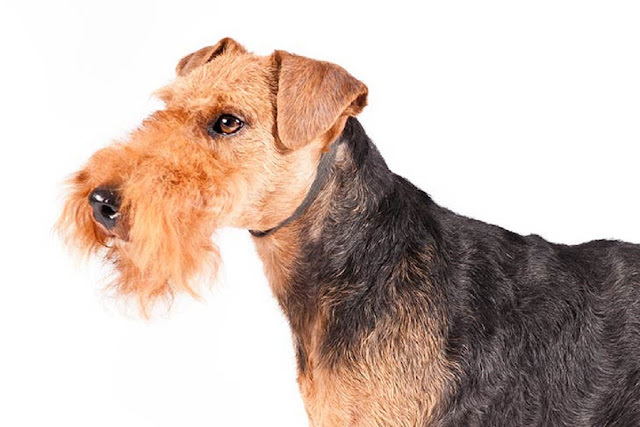 Welsh terrier dog breeds can be trained with different approaches. What you need to understand is that when training a Welsh terrier dog, you need to be firm but calm. The dog can be taught to do a lot of tricks. In fact, this dog breed can do well with flyball tricks and tricks that have to do with catching flying things like a Frisbee. Welsh terrier dog’s coat should be brush at least once a week to get rid of loose or dead hair. This would help avoid unnecessary shedding within the house. Although regular bathing is not really necessary, it is recommended that you wipe off dirt and dust regularly with a wet towel. Due to Welsh terrier high energy level, it is recommended that the dog is kept in a fenced in yard. This will give the pooch enough space to play catch. But, if you regularly take them out for exercise, Welsh terrier can do without a yard. One of the things that always get people’s attention about this breed is their superb ability to jump. Due to this ability, a Welsh terrier dog’s is sure to provide a lot of fun for people. The major reason this dog can jump and hop as he does is that of his long legs. Due to these legs, the dog can do a lot of tricks that other dog breeds cannot do. The major reason it is necessary to know all these about Welsh terrier dogs is that understanding, these facts will enable you to discover the best way to care for your dog. And it will also allow you to decide if a Welsh terrier dog will be the best pet for you. By learning everything you can about Welsh terrier dogs breed, you will obtain the information you require to meet your puppy needs. This means that you will be able to develop a good relationship with your dog. Even though, learning everything you can about Welsh dogs is not really easy. You have to remember that life sometimes requires sacrifice.